Coast City is a lovely bay mare by Stakes winner CARNEGIE, sire of 16 Stakes winners including TUESDAY JOY, VISION and POWER, CARNEGIE EXPRESS. She is out of a Stakes winning mare PALM BEACH BABE. 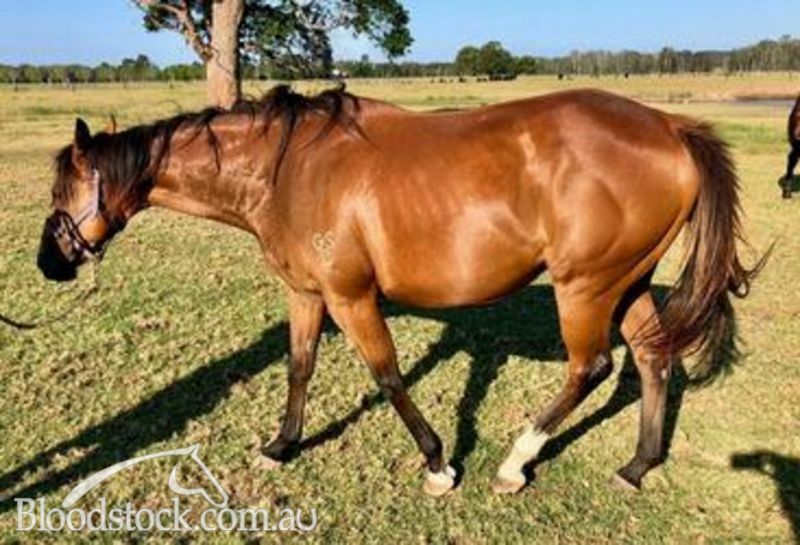 A beautiful natured and well bred mare in foal to the Listed Winning and Group 1 placed stallion in SEBRING SUN who stands for $3300. She has a lovely MAY'HAAB filly at foot Her full brother (Hitman) recently ran second in a Wyong trial and has gone for a spell. 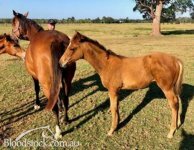 Both foals are BOBS eligible. Mare comes with a live foal guarantee. 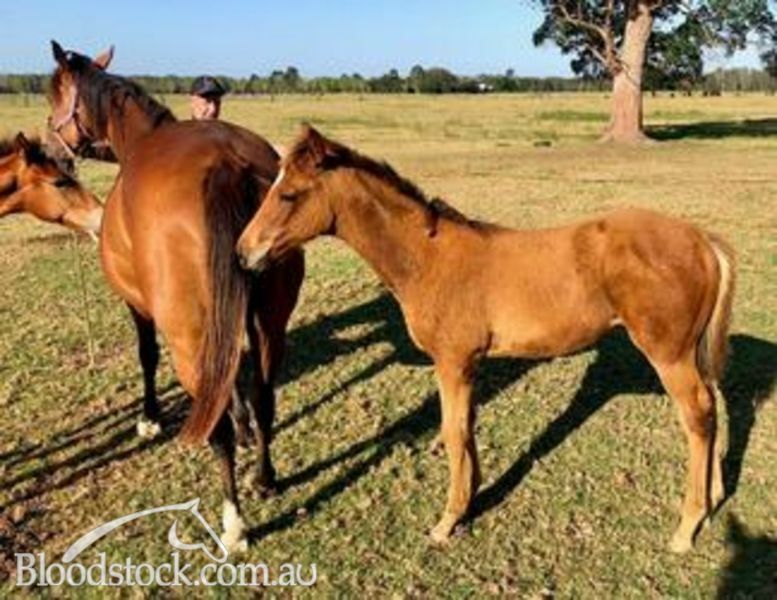 Coast City has had 7 foals 5 to race for 4 winners including NICCONI mare TIACONI a 4-time winner with $84,560 in prizemoney. 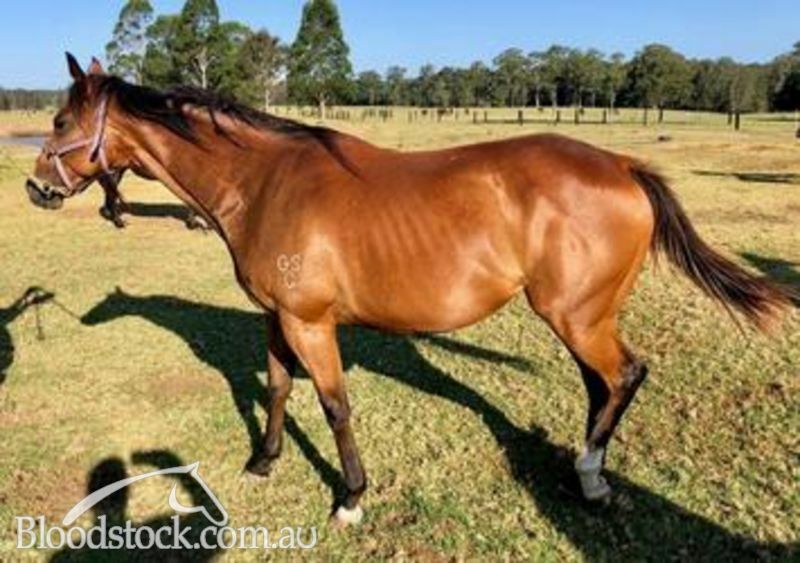 This is a great opportunity for someone to get a decent horse at a very reasonable price. CARNEGIE (IRE) (1991). 7 wins, Prix de l'Arc de Triomphe, Gr.1. Sire of 820 rnrs, 431 wnrs, 14 SW, inc. Tuesday Joy (STC BMW S., Gr.1), Amalfi, Vision and Power, Perlin, etc. Sire of the dams of SW Maurice, Kushadasi, Gondokoro, Zabeelionaire, Whobegotyou, Savvy Nature, Antonio Lombardo, Addictive Nature, Monster Kaka, Gorbachev, Master of Arts, Jungle Edge, Meisho Naruto, Annie Higgins, Mrs Kipling, Epicharis, Wolfendale, Morvada, etc. Palm Flyer (f by Flying Spur). 4 wins-3 at 2-to 1200m, AJC All State Electrical Services 2YO H., Malaya 2YO H., Singapore TC Benchmark 75 H., 2d AJC Ma Cherie 2YO H., Singapore TC Benchmark 74 H., 3d AJC Fairfield Advance Newspaper 2YO P., Singapore TC Class 3 H., Benchmark 75 H.
Showmanship (c by Quest for Fame (GB)). 2 wins at 1600m, MVRC Super Vobis 3YO H., 2d MVRC 150th Night Race H., 3d VATC Sharp Corporation P.
Medieval. 3 wins from 1350m to 1650m, BRC Racezone H., Designline H., 2d ATC TAB Highway H., 3d BRC BOQ Hamilton H.
Critical Touch. 5 wins to 1400m, A$97,960, to 2018-19 in Aust. Inorr of Yishay. 2 wins at 1000m in Aust. Nediym's Touch. Winner at 1200m in Aust. Dr Barnard. 13 wins to 1200m, A$222,415, BRC Coca-Cola Amatil H., 2d BRC Montrose Access Ownit Homes H., Double One 3 Teneriffe H., Huidon Group Accommodation Supplies H., Sirromet Wines H., Lovefox.com.au Country Cup, 3d BRC BDO Kendalls H., Broncos Business Club H., Instinction at Eliza H., Maxgaming H., Goulburn Valley H., Blackwater Quarries & Concrete P., Club Super H., Radford Electrical H., Austcover H.
Just Our Luck - Super Brother (H.K.). 4 wins to 1200m in Aust. and HK, HKJC Boston H., Equidia Racing Channel H., Frigatebird H., 2d HKJC HKU Faculty of Education H., 3d HKJC Regency Horse H.
Huckleberry Dane. 4 wins to 1200m, A$162,465, BRC 1300 Comfort H., Superior Pak H., Sky Racing P., 2d GCTC Magic Millions Sprint H., BRC Makers Mark H., Ticketek H., 3d BRC Sun Disk Systems H., Qld Tatt's RC Sky Racing H., GCTC Magic Millions P., BRC Paynter Dixon H., The Good Guys H., Coca Cola H., Mimiki Foundation H.
Eynhallow. Winner at 1200m in 2018-19 in Aust. Miami Jetstream. Winner at 1400m in Aust. Kudero (g Choisir) 12 wins-1 at 2-to 1200m, A$540,900, ATC Cancer Foundation H., Theraces Sprint H., Ibis Milano Restaurant H., BRC Brc.com.au H., Lilivale Endless Maize H., Illawarra TC AJ Illye Memorial H., SCTC XXXX H., 2d ATC June S., L, BRC Bluescope H., ATC Byron Thomas Recruitment H., Lest We Forget H., 3d ATC Ibis Milano Restaurant H., Turf Club H., BRC PFD Foods H., 4th ATC Star Kingdom H., Gr.3, Gosford RC Takeover Target H., L.
Malambo (g Choisir) 5 wins to 1300m, A$249,965, AJC Randwick Betting Auditorium H., STC Jacob's Creek Sparkling H., 2d STC Darby Munro H., L, AJC Super Impose H., ATC Centennial Park H., St Johns Park H., STC Theslipper.com.au H., Eeaa Best Venue Team 2008 H., Golden Slipper Festival H., 3d Wyong RC Magic Millions S., AJC Australia Day at Warwick Farm H., Randwick Betting Auditorium H., ATC Happy 35th Birthday Mario Tartak H., Wyong Rugby League Club H., STC Rosehill Event Centre H., TAB Number 1 Club H.
Miss Independent. 3 wins-1 at 2-at 1200m, A$551,155, AJC Inglis 2YO Classic, STC Inglis BC3 Future Stars Sale H., AJC Research H., 2d AJC Gold Edition H., Wilson Asset Management H., Fairfield H., ATC TAB Sportsbet Iphone App H., CC's You Can't Say No H., STC Keno H., Canterbury Event Centre H., Pages Event Equipment H., 3d ATC Harris Farm H., Alpha Flight Services H., Omni H., AJC Catalan Opening H., Paul Curran H., TAB Number 1 Club H., STC PJ Gallagher's Irish Pub H., Turner Freeman H., Ruby's Freeway 2YO H., 4th BRC Nudgee H., L. Producer. Speedonice. 5 wins from 1000m to 1600m in Aust. Bradbury's Quest. 2 wins at 1200m, 1300m in Aust. Princess Kalli. Winner at 1300m in Aust. Mambo Miss. Winner at 1100m in Aust. Unterhaltung. Winner at 1000m in Aust. Produce Record: Dam of 7 named foals, 5 to race, 4 winners. 2008 A Rare Old Time (f by General Nediym). Winner at 1650m in Aust. 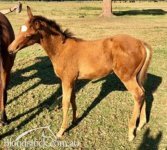 2009 Beena Lontime (g by Lonhro). Unraced. 2011 Tiaconi (f by Nicconi). 4 wins to 1100m, A$82,605 in Aust. 2012 Kikimora (f by Snippetson). 2 wins at 2 in Aust. 2013 Good Verdict (g by Star Witness). Winner at 1100m in 2017-18 in Aust. 2014 Stage Pass (f by Tickets). Placed to 2018-19, 3d ATC Book Spring Hospitality H.
2016 Hitman (g by May'haab). Unraced. 2017 (c by Direct Charge). Missed in 2010; not served in 2014. Served by Sebring Sun. Date of last service, 12.11.2018.